Betway was established in 2005 and is one of the best platforms around for sheer ease of use. They have a full suite of betting options from esports, to bingo, slots, table games and the chance to wager on in-play sports. Betway are open to players from across Europe, offering bonuses, promotions and free bets to keep you coming back for more. Their diverse sportsbook extends to national and international fixtures in football, horseracing, basketball, martial arts and more. Betway have earned a high profile in the industry with sponsorships on many televised sporting events. Their portfolio includes deals in darts, tennis and snooker, as well as esports. They’ve made a landmark sponsorship deal with West Ham, worth £20 million over two years, along with a three year deal at the Aintree Racecourse and another three year deal with World Snooker. The site is revamped regularly, adding extra products to their collection and maintaining a smooth user experience. Approval from eCorga, the Malta Gaming Authority, and ESSA (Sports Betting Integrity) amongst others, should reassure gamblers that payouts are fair at Betway and that customer’s online security is taken seriously. In terms of odds quality, Betway is in an average position compared to other bookmakers. They rarely cut down to the odds offered by certain rivals, though they won’t regularly offer the best odds either. Betway take a more steady approach, you’ll get good value, but don’t expect extremes. Odds also vary from sport to sport, if you’re a fan of football, basketball or American football betting, they will probably seem very generous, but ice hockey and tennis does tend to have higher betting margins. Betway have all the popular betting markets people expect to see on a solid platform, these include; handicaps, correct score, half time results, first goal scorer, winner, (away, draw, home) and a whole lot more. In the Premier League alone, Betway offer 100 markets per match throughout the entire season. Players can select the betting market they think will deliver the best value, then go for a single bet or combine several in order to increase their potential returns. 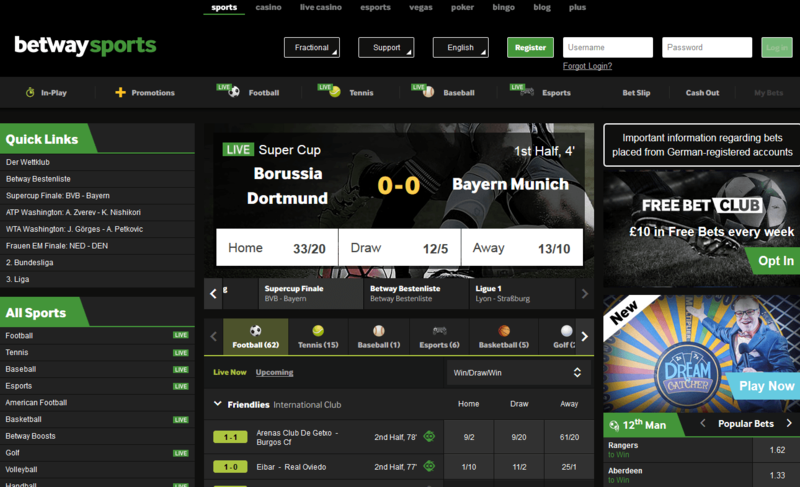 The Betway website is well-designed, with a logical navigation format and clearly marked areas for the various games. There’s a lot of black space, but this is punctuated with plenty of good quality sporting images and colourful graphics which serve to highlight different features, like promotions and welcome offers. To the left of the screen is a menu of Quick Links, this enables you to hop straight to the location that interests you, from Horse Racing Daily Cards, to Daily Football Matches or Betway Boosts. To place a bet on the Betway website, you select the sport and event which interests you and click on the odds price; this will add the wager to your bet slip. Then choose an amount to stake and the possible returns will be revealed on the bet slip, below the first amount. If applicable, you can select ‘Each Way’ at this point and this will change the betting slip to read Each-Way, instead of Win. Choosing the ‘Accept only higher odds’ offer means you agree to the odds being increased automatically. In the same way, if you choose the ‘Accept any odds’ offer, you agree to either an increase or decrease in the current odds of your game. To combine a number of markets in one bet, just click on any additional odds prices to add them to your bet slip. The multiple bets section will show each type of bet, so you can choose the ones you prefer. Once everything is in place and you’ve checked it over, click Place Bet and the details of your wager will be confirmed. The Betway app is available for iOS users and people with Android devices; it’s simple to download from either the App Store or Google Play and is basically an extension of the full site. Mobile is the future for most brands, and in the gambling industry it’s especially important to let fans get in on the action from wherever they happen to be. New users who download the app will get a free bet of £30 at certain times of year, to get them started on the platform. The £30 is credited immediately, unlike the vast majority of other sports betting apps which provide the same type of offer, but include a 24 hour delay before allowing you to spend the bet. Moreover, you’ll still get the £30 bet whether you win or lose, which also differentiates Betway from other online gambling companies that only give you the funds if you lose. Betway is licensed throughout the world so players from Denmark, Italy, and Spain, as well as the UK can use the app. As Betway is part of a larger group of companies, by downloading the Betway Live Sports Betting app, you’ll also gain access to their casino games. The app is well set out and simple to work through; just click the Betway tab to select an option and start playing. The app opens on a page which shows all the latest promotions and deals, so you’ll be sure of catching up with what’s available before you get side tracked. If you do happen to click straight past this area, they have also included a handy promotions tab, so you won’t waste time searching for permanent or limited time offers. The app has been developed to be easy on the eye, with no fancy fonts or small text, so you can read what you need in every section. Games sections are generally navigated using thumb swipes, as with the casino area, which acts as a portal for the vast amount of Vegas-themed games on the app. New products are added from time to time, but the current betting coverage at Betway stands at a respectable 23 sports. The list includes; American Football, Baseball, Boxing, Cricket, Formula 1, Handball, Poker, Rugby league, Snooker, UFC and a range of winter sports. The Betway live streaming service is free in Sweden, Ireland or the UK, so long as you can log in to your account and you are in credit. It’s available when the live streaming icon, which is a green tick, is shown on an event. There are plenty of football streams; from the Russian Premier League, to the German Bundesliga and other international fixtures. Alternatively, you can tune in to Euro Vollyball, ice hockey from the KHL, ATP Tennis highlights and Eurobasket games. As well as watching live events, you can bet in-play as well. The live betting interface is very simple to use, just click the Watch and Bet icon and you’ll be taken to a screen showing the latest odds, along with a stream of the event. You can place a bet right there and keep watching to see if you end up a winner. To attract more members and reward loyal players, Betway have a range of bonus offers. These are made available through many third party sites that promote sports betting and link to Betway. Offers can range from £10 up to £100 and to claim you’ll need to follow the specific link provided. Each bonus will have its own terms and conditions, but these will be made available when you arrive at the Betway site. The Sports Welcome offer matches a customer’s first deposit, to the equivalent of a 300% bonus. The minimum first deposit is £10, or the same amount in another currency and this has to be paid in within seven days of a new account being opened. The amount of the bonus varies from location to location, in the UK, Ireland and Canada, the maximum offer is £30 or €30 or $30 and is awarded as a free bet. To use it customers have to place a bet to the value of their first deposit. As soon as this level is reached, the free bet will be activated. Once you’ve accepted the free bet and used it, you’ll need to meet a specific set of wagering requirements before making a withdrawal. Free Bet offers are provided at certain times of the year to experienced players, these are limited time deals that expire within 7 days, unless the terms specify otherwise. Any free bets have to be used in one single transaction and they cannot be used for multiple wagers. The maximum return you could get is £20 000, or the equivalent in another currency. To reward their regular players, Betway have created a loyalty scheme that works on a points basis. For every £10 you bet, they will give you five points. As you build up a points balance, you move through the six different levels, from Blue to Privé, and enjoy more generous benefits. Everyone starts out as a Blue member, but to reach the Silver level you’ll need 5000 points, for Gold it’s 25 000 points, for Platinum it’s 75 000 points, for Diamond it’s 1000 000 points and to reach the final level, Privé, you’ll need to earn 2,500 000 points. Bear in mind that if you don’t log in to your account, or place any bets for 90 days, all your points will expire. Betway are very flexible when it comes to making a deposit, each payment method is secure and you’ll be able to top up your account at any time. After registering as a member, log in to your account and choose the Bank icon in the lobby, select the payment type you prefer and enter your details. You are then free to confirm the amount and it will be instantly available in your account. Betway saves your details securely, so the process will take far less time in future. You can pay in using Visa, MasterCard or Maestro cards, or via a direct bank transfer, or through e-wallet methods like Neteller, PayPal or Skrill. When you open an account Betway will ask for a couple of forms of identification, but they will also need up to date ID each time you want to withdraw money. This is to comply with the laws around international money laundering, so they are obliged to ask. Once they have copies of the documents, your withdrawal will be processed. Withdrawals are initiated from your account just like payments, the minimum amount is £10. You can only have the funds paid back to the credit or debit card, bank account, or e-wallet service which you originally used to make a deposit – no fee is charged. You can reach the Betway customer services team through clicking the live chat tab on the website for an instant response, or by calling them free on 0808 238 9841. Both of these options are available 24 hours a day, seven days a week, so you’ll never be left without support. Staff take a professional approach, quickly answering questions or guiding you toward relevant information on their website. Alternatively, you can send them an email at support@betway.com. If you feel your problem has not been handled well, or you’d like to take the matter further, you can approach the Independent Betting Adjudication Service LTD (I.B.A.S) for help. Betway are affiliated with this service, so the IBAS team of impartial experts will look into any customer complaints and resolve the issue in a way that is fair for both parties. Security at Betway is taken very seriously and like many other online interfaces that deal with a regular stream of financial interactions, they use Secure Sockets Layer (SSL) encryption to protect their site. SSL stops third parties from gaining access to information going from or to the site; this includes bank account details and login information. Furthermore, the Betway Casino is powered by a MicroGaming platform, which is one of the most respected types of gambling software around. To assure their customers of receiving fair treatment when playing at Betway Casino, the company has each game regularly inspected by independent auditors at eCommerce Online Gaming Regulation and Assurance (eCogra). Betway have created a unique gambling platform that’s safe, user-friendly and free from unnecessary clutter. Customer service is reachable through a number of different methods, and the team are well-trained in supporting people who use the site. In terms of design, the Betway platform caters for players who want a quick response, plenty of choice when it comes to betting markets and the chance to try out new games which may be of interest. They may not provide hugely generous odds, but they tend to be fair and the sportsbook provides enough choice for all levels of player. The bonuses are there, but as with most online gaming there are drawbacks, such as having to bet many times the bonus amount before being eligible for a payout. However, the Betway Plus Points Scheme provides a genuine opportunity for regular players to build up a points balance, and then receive better cash bonuses on their preferred products.